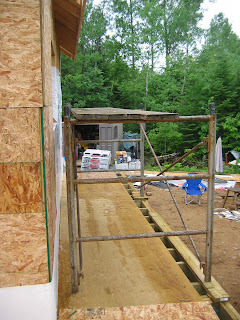 Cottage on the Edge - the DIY Cottage Blog: Building Smart - order is Important! Building Smart - order is Important! With good planning it was easy to reach spots like the main floor walls or even the roof without having to use ladders or even scaffolding. 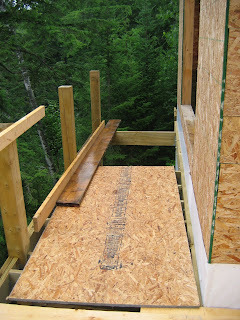 Here the completed deck substructure covered with some spare pieces of plywood served as a ready-made scaffold. This allowed us to move around quicker and to use stepladders rather than extension ladders or scaffolding. Where getting even higher was necessary, just adding one layer of scaffold was all that was needed.